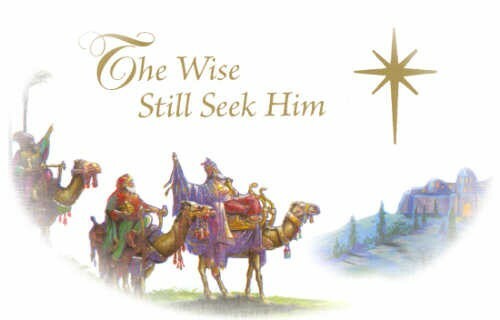 Prayers for the Week - Epiphany! Hello my friends, and welcome to this week’s Prayer for the Week post. Today is Epiphany Sunday in the life of my church, so as such I thought the picture shown above was appropriate for today. I don’t really have a lot to say for today, except that the words listed in the image “The wise still seek Him” are as appropriate today as they have ever been. I guess, in the end, I’m left with one question — one that I hope I know the answer to for all of us — “Whom do you seek?” Or, perhaps more telling, “What do you seek?” If the answer is not Jesus, well, I believe you are looking for the wrong thing. If you think differently, well, that’s your choice. Please take the time and pray for all of these requests. It does a world of good for those that are suffering, and I truly appreciate each and every prayer that you lift up for those that need them. If you have your own prayer requests you need us to pray for, please leave them in the comments. If you don’t, we won’t know to pray for you. My friend Kuleen has some need of prayers for her friends. Here is what she wrote on Facebook:A friend of mine is in desperate need of prayers. Her 12 year old son has what is believed to be some form of pneumonia. His condition continues to get worse while the doctors try to figure out what he has and how to treat him. He is now intubated and the ICU. Please pray for Ben and his family.Please pray with me:Father God, we know that You are in control of all situations, even ones that scare us to know end such as this one with Kuleen’s friends. Please shower Your love and care upon Ben and his family — show them that You are there for all of us, if we just ask for You, and please also give Ben’s family Your Peace that they so desperately need so that they may be able to help Ben in whatever way he needs. Please also grant them the strength to deal with this, both now and in the future, for as long as is needed until Ben is better. I ask these things in the name of Your wonderful Son Jesus with Thanksgiving. Amen! I just wanted to let everyone know that baby Ryan is being released from the hospital in 10 days if everything goes as planned! Thank you to everyone for your thoughts and prayers. We appreciate each and every one of them. Heavenly Father, the wonders of Your miracles know no boundaries, and we are so close to seeing evidence of Your Healing Touch in Baby Ryan. Please keep his progression moving forward so that he may be released from the hospital when he is supposed to be, and please continue to shower Your Love, Peace, Comfort, and Strength on Ryan and all of his family so that they know that You are with them. Thank You for continuing to show Your love to all of us, no matter what the circumstances are, in all of our lives, and thank You for reminding us all that we are able to move mountains if we just remember to call on You for help. It is in the wonderful name of Your Son Jesus that we pray this with abundant joy and Thanksgiving. Amen! A friend of mine has prayer requests for a family that is going through a lot right now. Here is what she wrote:Feel bad but right now it’s looking like my time tomorrow is needed for a friend. Her husband in horrible accident Nov. 5th when 15 yo son pulled out in front of transfer truck….he had surgeries on shoulder, bowel, and knee……b/c of horrific wreck, testing showed that he had mass in chest which was confirmed 3 weeks ago with non-Hodgkin’s lymphoma……was suppose to start chemo Jan 7 but just 5 days ago he was admitted back into the hospital for an infection in his knee, well infectious disease drs came in and said its a bone infection and that he will need a pic line and antibiotics to clear infection. Well, now yesterday, her best friends husband died, and she needs to go see her, get hubby home from hospital. She needs me to go to her house, take her son to baseball, gym, clean her house……I don’t imagine I’ll be home by 4:30…..but I feel that her house helping her is where I need to be!Sometimes the struggles we face are daunting, and seem to pile up on us all at once. However, remember that nothing is impossible for God, so please lift all of this up to Him, and ask Him to sort it all out so that all of the tribulations may be dealt with and handled. The biggest thing I can pray for is healing and Peace, and I will do that. Thank you for praying for these families. In addition to our prayer requests, we certainly have some praises too! Let’s shower God with all of His Glory as we celebrate all that He has done for us! Right off the bat I’ve got two great praises! Here is the first praise, as it involves my friend Deb and her husband. Here is what she wrote on Facebook:Hubbly is home from the hospital! Hoozah! He’s feeling good and his spirits are up! One thing was really reinforced by this and that is to continue to live a healthy lifestyle. We’re celebrating every day! Visited a little church in Gretna VA this morning. The preacher knew Early from back when she was a child and hadn’t seen her in about 25yrs, He started the day talking about how prayers do get answered and then asked Early and Viktoria to stand up and explained that the church had been praying for us while we were in Poland during the adoption. Total strangers knew us and about the difficult process we went through. What an amazing group of people! My friends, the power of God is incredible, and He is working miracles that we don’t ever know about. I urge you all to put your trust, put your faith, in Him, and Believe that it will be okay, because if you believe that with all your heart, it will be okay. As always, thank you to each and every one of you for taking time to read over these prayer requests, and for praying faithfully over them. It means more than you will ever know, and I know I speak for everyone that has ever left a request when I say that. If you ever feel like there is nothing you can do for some situation, or somebody, please remember that you can always pray for them. That, more than anything, will help them more than anything else. Never forget that. Until next time, my friends, may God grant you all His Peace on your lives so that you may have a safe, productful, joyous week, and return safely to us next week. Amen. To everyone of my friends & family.. Please I ask you all for a very special prayer tonight! I’ve just gotten word that someone that is extremely near & dear to our hearts has been involved in an accident and we don’t have any further news from FHP. Please keep my daughter and me in your prayers and thoughts today. God knows the reason. I feel sorry for the homeless person who sleeps in a doorway at a Dr.office across the street every night. I may not have a job, but I had a lot of peanut chocolate candies and Craisins packages that we got from Mickey’s Halloween party at the end of Oct. So I put them in a bag and put it on that doorway for the person. Next Post: Thinking about a runDisney event!